As fancy as any charger is, they always seem to have the same glaring issue. Whether or not they are in use, a litany of cables will be strewn across the table. Many brands have attempted to remedy this obnoxious eyesore, usually with cable ties or adhesive clips. Native Union took a novel approach to solve this issue -- a cylindrical cable wrap that recesses into a housing when not in use. It can charge three USB devices at a time, and the cables can be completely out of sight during the times they aren't needed. Additionally, a soft halo ring of light helps you find your cords in the dark and an optional wall mount helps make Eclipse a handy bedside/couchside companion. There is a lot to unravel here, so let's dive in. Native Union decided to include only three USB ports in Eclipse, a sharp contrast to many other chargers that attempt to integrate as many as possible. Before making that decision, the company surveyed thousands of people, learning that while most people had six devices that need to be charged, they only charge two to three each day. After looking at our own habits, we agree that we rarely charge more than three devices at once. Two ports are the standard USB-A, with the third a USB-A/USB-C combo port. A small moveable panel allows you to alternate between the two depending on the device you need to charge. All USB-A ports can charge at 2.4 amps, while USB-C is capable of 3A. That won't be nearly enough to charge a MacBook Pro quickly given that it is only supplying 15W -- but it will work for most mobile devices, including the Nintendo Switch. One of our first thoughts was the top panel would be an excellent home for a wireless charger. Native Union pushed back saying that not everyone uses wireless charging yet. 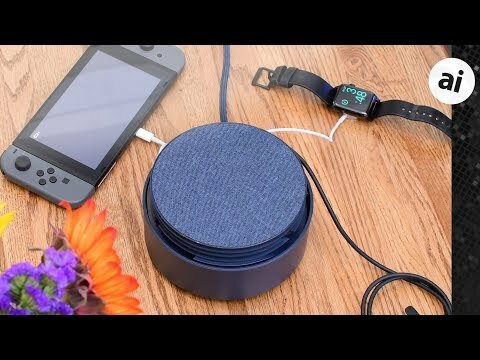 If they were to integrate a wireless charger, it would be bigger and more expensive for only a small portion of the user base. Native Union mentioned the top is a solid surface that would be a great home to any additional wireless charger, such as their Drop Qi charging pad. A quick double tap on the center of the surface will trigger the motor to raise the innermost housing from the outer shell. Each individual USB cable, which can be up to 8 feet in length (24 feet total), has their own track around the center. They connect to one of the three USB ports under the cable housing, then just wrap around one of the three levels. That way each cable can be wrapped or unwrapped without getting in the way of one of the others. If the cable end is small enough, such as that of a Lightning or micro USB cord, the end can fit in here too. That way, when closed, the entire cable is hidden. Some cables, like an Apple Watch charging puck, is too large to completely hide so the end would still be sticking out. To actually set it up and connect the cables, you first double tap the center to raise the housing, then give it a small counter-clockwise twist. The housing then comes free, exposing the trio of hidden ports, displayed almost like fan blades. Plug in each cable to their USB port, re-connect the housing, then wrap each cable around one of the three tracks. That's it. There are two options for the Eclipse. Flat on the table, or mounted on a wall. I first placed Eclipse on the table next to our couch, though I also tried it bedside, and mounted on the wall. Of all three, the wall mount was by far my favorite. To mount it on the wall, a small plastic mounting bracket is included, as well as two screws. Eclipse just slides over top and locks into place. Its heavy nylon-wrapped cable doesn't look bad at all going down the wall. Native Union also includes a leather wrap for this cable as well, which is very handy. Eclipse does wonders to tidy up your tabletop or nightstand. But, that's the rub -- if the cables don't get wrapped up, it is as messy as any other multi-device charger. I found the built-in light even more useful when mounted on the wall compared to on the table as well. To activate the light, a single tap on the center of the surface will do. It even has a nice moving effect as it turns on and off. Frequently, I found the lighting effect too dim to be of any real use, but it was more useful when on the wall compared to the table. Our biggest qualm was the lack of full USB-C PD suitable for a MacBook Pro. I'd love for an easy to access MacBook power supply right by the couch I could pull out when needed. We give the Native Union Eclipse charging station four out of five stars. After raising almost a million dollars on Kickstarter, it is clear many people are eagerly looking for a solution to the problem of tangled and unruly charging cables. Eclipse is the most promising solution yet, with the lack of USB-C PD for our MacBook the biggest obstacle. If mounted bedside, that likely wouldn't be a problem at all, but in any other room, it is something that needs to be considered. Eclipse, which comes in six different color configurations is available both on Amazon and Native Union's website. They start off at $79 for the fabric options, go up to $99 for the wooden inlaid pair, and reach all the way up to $159 for the special edition marble ones. I bought 2 of these things when they were on kickstarter. I end up using one of them, the other one sits in my cellar. Wouldn't buy again. I was seriously considering this until I learned there's no wireless charging on top, that would have been a game changer. Seriously. It would have taken little effort to engineer a wireless base on it. Bet that their version 2.0 will include it.